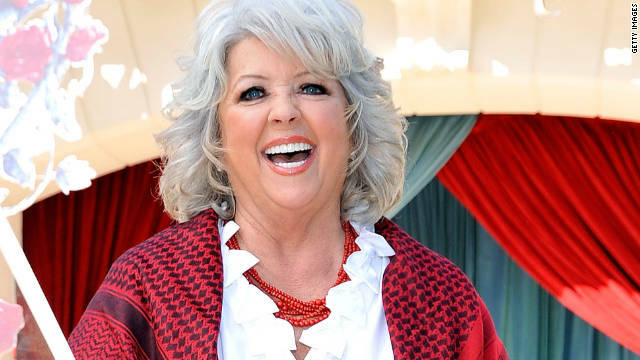 Paula Deen, star of the Food Network’s “Paula’s Best Dishes,” built her reputation on traditional Southern favorites such as fried chicken, macaroni and cheese, sweet tea and butter - lots and lots of butter. For years her show and articles such as “7 Things Paula Deen Fried - and Ate” sparked rumors that the cooking icon had diabetes. She was often criticized for promoting food high in fat and calories at a time when about a third of American adults are considered obese. Now Deen is going public with a diagnosis she received three years ago during a regular checkup with her doctor: She has Type 2 diabetes. The celebrity chef is launching a campaign with her two sons, Bobby and Jamie, called Diabetes in a New Light as part of her agreement to be a paid spokeswoman for Novo Nordisk, a maker of diabetes medications. The family is offering new, lighter versions of their favorite recipes and advice on managing the disease. Deen said keeping her diagnosis a secret for so long wasn’t a choice based on protecting her reputation. “I wanted to bring something to the table when I came forward,” she said on "Today." About 26 million people in the United States have diabetes, according to the Centers for Disease Control and Prevention. The CDC estimates another 79 million Americans over age 20 have pre-diabetes, or elevated glucose levels. There are two major forms of diabetes: Type 1 and Type 2. Type 2 is the most common. Type 2 is often called adult-onset diabetes because it develops over time due to low activity levels and a poor diet that causes excess body weight. Diabetes can lead to kidney failure, blindness, lower limb amputations, heart disease and stroke. It is the seventh leading cause of death in the United States, according to the CDC. Type 2 diabetes is like Russian roulette, Deen told USA Today on Monday in her first interview about her diagnosis. "It's about heredity. It's about age, lifestyle, race. I'm the only one in my family who has it. My grandmother cooked and ate like I ate, and she didn't have it." Still, the jokes about butter are flying - from bloggers mocking the irony of her spokeswoman deal to articles such as “The Paula Deen Dishes Paula Deen Shouldn’t Eat.” On the "Today" show, Deen rejected the criticism. “I’ve always encouraged moderation. On my show I share with you all these yummy, fattening recipes, but I tell people, in moderation. In moderation, you can have that little piece of pie,” she said. USA Today reported that Deen is walking a mile or more a day on a treadmill and is no longer drinking sweet tea to keep her sugar under control. She has dropped a clothing size since her diagnosis, according to the paper. I don't really care if Paula eats her own food or not. And I am of the opinion that her personal health is nobody's business. But where she loses my vote is with this deal she's cut with the drug company. The best way to treat diabetes II is diet and exercise. It's pretty obvious she's overweight in spite of having been diagnosed 3 years ago. Why would I take her advice on how to treat diabetes if she is obviously not following a healthy diet and exercise program herself? I think this is going to blow up in her face. maybe she should learn how to speak ENGLISH. i heard her pronound the word 'BREAD" using 3 syllables. I agree with you .....this will eventually blow up in her face. Knowing she had diabetes for three years and she continued with her poor eating habits and did not lose any weight tells me she cares more about money. Maybe she told herself someday when my stack of money is p to the sky then I will do a turn around and get healthy. When the doctor told her three years ago she has diabetes a big fat $$ sign lit up in her head. If she had taken the doctor's advice back then and done something to help herself get healthy there would be know endorsement deal today. As I said before.....it is about Greed. Her motivation is about money. This women is without integrity. As far as it not being our business.....well looks like we all have made it our business by posting our feelings one way or another. And as I said before.....when she went public she made it everyone's business. OK, CNN. You have fulfilled your journalistic mission to let us know that Paula Deen has diabetes. Can we move along now? Can we move on now. Paula Deen was never our doctor she is an entertainer and please, every celebrity chef on the cooking channel /food network is cooking with sour cream, cheese, butter, cream and more. Because Paula laughed at herself, flirted with us and was so cute about adding just another stick of butter – it's part of her schtick. so. if you don't like her, don't watch her and dont buy the medicine and by all means don't make her recipes. Shes an entertainer. And btw, who is this Anthony guy anyway. Seems someones a little jealous the deals keep coming Paulas way . . .
Clearly she has absolutely no clue regarding nutritional excellence. No wonder she's diabetic. It's a shame that instead of drastically changing her dietary habits that instead, she is going to be a spokesperson for the pharmaceutical industry. How about taking your health into your own hands instead of taking medication while continuing with your nutritional folly? Another Martha, as far as I am concerned. She hid her diagnoses until she made sure she had a nice fat deal on the table. But keep piling on the butter and fat on her shows. Her empire includes not only the cooking show which made her famous. Ms. Deene has her name attached to everything from kitchen gadgets and supplies, bakeware, and expensive and large furniture collections. Pretty hypocritical of her to continue profiting from this empire which began with pushing lots of sweets and high fat foods. Shame on you...three years til you could bring something to the table....whatever. You wanted to bring your full wallet to the table it sounds like to me.
. The times I have watched her oocking instructions, I've never heard her mention the moderation she now claims to have always practiced; she pandered to the over-eater and the person who didn't want to hear about a healthier way to eat. A spokesman standing with her on a TV news appearance argued that people who live in the Arctic regions eat a heavy fat diet and don't have diabetes. He failed to acknowledge the fact that they eat fish fat very different from butter fat and they don't consume the high volumes of white flour and sugar that Paula's oocking calls for. Therein lies her health problems. I doubt there are many people on this Earth who can eat a steady diet of the foods she prepares and maintain good health. Type 2 diabetes takes, on average, 15 years off a person's lifespan. It's not a death sentence, but wouldn't Paula be better off taking some personal responsibility in her health?? Type 2 diabetes is REVERSIBLE!! Eat a reasonable, whole food diet and exercise. I've always been concerned about the foods she prepares. I hope she gets better soon. I'd find something to help regulate your glucose naturally. Paula Deen’s Diabetes, is not 'a death sentence', too bad because it would free up some carbon footprint space for Her Royal Highness Queen Moochelle. My aunt has slowly altreed her diet partially for health reasons and partially for preference she has eliminated meat, dairy, and gluten. She does eat sheep, goat, and buffalo cheeses and milk and of course lots of fruit and vegetables! We have been introduced to many foods that we may not have otherwise tried it is fun and tasty. I waited for the dust to settle before commenting on Paula Deen's type II diabetes. I used to watch her a lot & even purchased several of her books & cookware but I have not in 5 yrs. I felt since she was the Queen Bee of Southern TV Cooking she had an oportunity to use the celebrity to educate the public on the poisoniing of America but chose instead to only profit from it. I agree that she's had 3 yrs. to turn her health around but after seeing her on the Today Show recently, it's obvious that she is weaker than her addictions. She over eats, under excercises, and probably smokes as well! Sorry, Paula, you lost me at that second helping of all the foods you know very well are not good for you in excess. Money will not take the lard off or heal your diabetes. By now you all have heard the latest about Paula Dean's plan to do healthy recipes. And regarding her spokesperson diabetes deal she has said she will donate a portion of what she earns from that. My thinking is...if it were substantial she would be outspoken about the actual percentage. Paula is a money making machine. She is an American and God Bless her she has the right as we all do. That being said.....I say she continues to show no remorse or integrity towards those who bought into her hook, line and sinker.